Richard Mosse: Infra, Open Eye Gallery, Liverpool, United Kingdom, March 30–June 10, 2012. Traveling to: Belfast Exposed, Belfast, United Kingdom, June 29–August 10, 2012; Sirius Arts Centre; Dublin Gallery of Photography; Centre Culturel Irlandais; Limerick City Gallery of Art. Richard Mosse: Infra,Weatherspoon Art Museum, North Carolina, January 14–April 15, 2012. 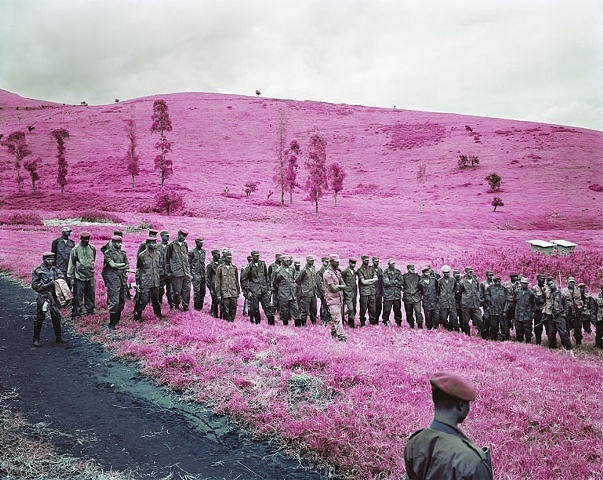 Richard Mosse: Infra, Mermaid Arts Centre, Co. Wicklow, Ireland, January 26–March 1, 2012. Richard Mosse: Remains of the Day, Moot Gallery, Savannah College of Art and Design Galleries, Hong Kong, December 19, 2011–March 2, 2012. Richard Mosse: Infra, Jack Shainman Gallery, New York, November 17–December 22, 2011. Richard Mosse: The Fall, Jack Shainman Gallery, New York, November 19–December 23, 2009. Richard Mosse: Airside,Jack Shainman Gallery, New York, November 13–December 20, 2008. Trainers, Kilkenny Arts Festival, Kilkenny, Ireland. Curated by Hugh Mulholland. Nothing to Declare, Derby University, October–December 2007. Spectral Landscape with Viewing Stations / Color and Contemporary Art, Gallery 400, University of Illinois at Chicago, April 27–June 9, 2012. Curated by Pamela Fraser and John Neff. Immortal Nature, Edel Assanti. London, January 26–March 3, 2012. Curated by Gordon Cheung. The Big Reveal, Kemper Museum of Contemporary Art, Kansas City, September 23, 2011–April 15, 2012. 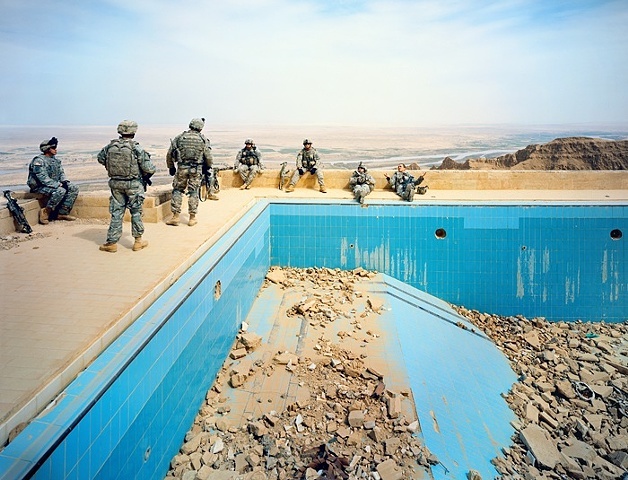 FotoWeekDC, Pulitzer Center, Washington, D.C., November 5–12, 2011. Dublin Contemporary 2011––Terrible Beauty: Art, Crisis, Change & The Office of Non-Compliance, various venues throughout Dublin, September 6–October 31, 2011. Curated by Jota Castro and Christian Viveros- Fauné. The Long View, Gallery of Photography, Dublin, Ireland, July 5–August 28, 2011. I Want to Go Somewhere Where the Weather Suits My Clothes: A Fall of Light on Fabric, Mothers Tankstation, Dublin, April 13–May 28, 2011. Tracing the Unseen Border, La MaMa La Galleria, New York, April 21–May 22, 2011. Curated by Omar Chahoud Lopez and Ian Cofre. New York Photo Festival, New York, May 11–15, 2011. The Spectacle of War, The Empty Quarter Fine Art Photography, Dubai, March 14–April 30, 2011. Crossing Boundaries: Photo-Film-Photo, Triennale der Photographie, Hamburg, April 1–6, 2011. Selected by William Ewing. With Hands and Feet, Torrance Art Museum, California. Curated by Aoife Rosenmeyer. B-Sides: A Dialogue with Contemporary U.S. Photography, FotoFest Headquarters Gallery, Houston, October 21–December 11, 2010. Guatephotofestival, Carlos Mérida Museum of Modern Art, Guatemala, July 6–31, 2010. Curated by Adriana Teresa. Postcards from the Celtic Tiger, Xuhui Art Museum, Shanghai, China, July 23–31, 2010. Curated by Peggy Sue Amison. Landscapes of Quarantine,Storefront for Art and Architecture, New York, March 10–April 24, 2010. Curated by Geoff Manaugh and Nicola Twilley. Para Bellum 12mm, Ca l'Arenas, Museu de Mataró, Barcelona, February 5–March 21, 2010. Curated by Andrea Aguado. NY/Prague 6, Futura Center for Contemporary Art, Prague, January 13–February 24, 2010. Curated by Omar Lopez-Chahoud. Leben Elementar, Fototriage Trier. Curated by Christophe Tannert. The Dialectics of Terror, Chelsea Art Museum, New York, November 21, 2008–January 31, 2009. Yale MFA photography 2008, Gallery 339, Philadelphia, July 11–September 6, 2008. Media Matters, Friedrich Kittler and Technoculture, Tate Modern, London, June 27–28, 2008. Yale MFA Photography 2008, Danziger Projects, New York, May 27–31, 2008. Yale Photo MFA thesis show, Green Gallery, Yale School of Art, New Haven, Connecticut, May 16–27, 2008. New Insight: Selected Work from America’s 12 Leading Art Schools, Art Chicago, Illinois, May 1–4, 2008. C International Photo Magazine, Phillips de Pury, New York, September 7–26, 2007. Bloomberg New Contemporaries 2005, Barbican Art Gallery, London. Traveled to: Cornerhouse Manchester, United Kingdom; Spike Island Bristol, United Kingdom.